Who wants to eat healthier in January? I know I do. With this salad you are getting in good veggies, but you also have a little indulgence with creamy ranch dressing and a little bit of crispy onion strings for some crunch. The red onion and corn confetti make the salad fun and give lots more texture. Tangy barbeque sauce deepens the flavor. Throw some smoky chicken breast in the mix and you have a filling and flavorful dinner salad that you can make at home for cheap in 20 minutes! My husband loves salad. He loves salad more than I do… there, I said it! Don’t get me wrong, I like making salad at home, and I love making homemade salad dressings. It makes me feel like I am totally awesome. However, when we go out to a restaurant and my honey orders a salad, and I order some big plate of ummm… not salad, it doesn’t make me feel very cute. I want to feel like a dainty lady, you know? Not that it stops me. Haha. Who else knows what I mean? I know you are out there, ladies! 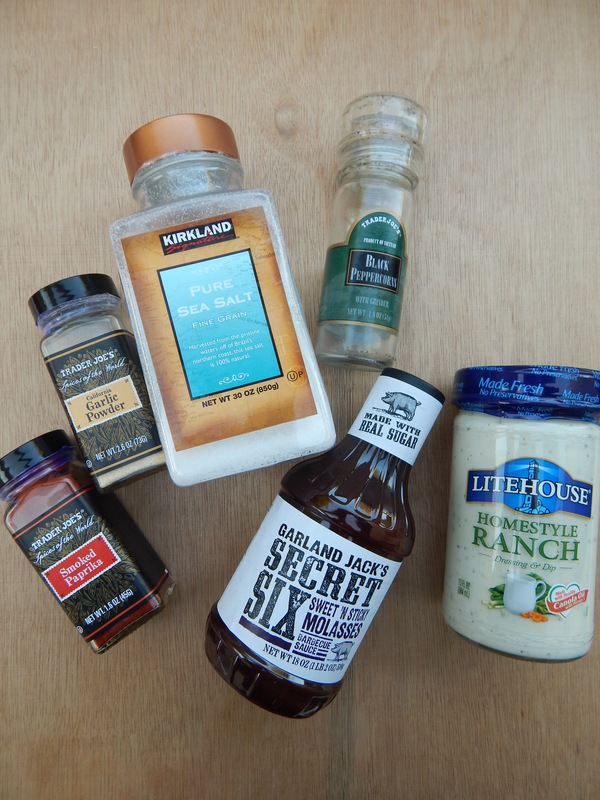 These are the seasonings I use on the chicken breast. 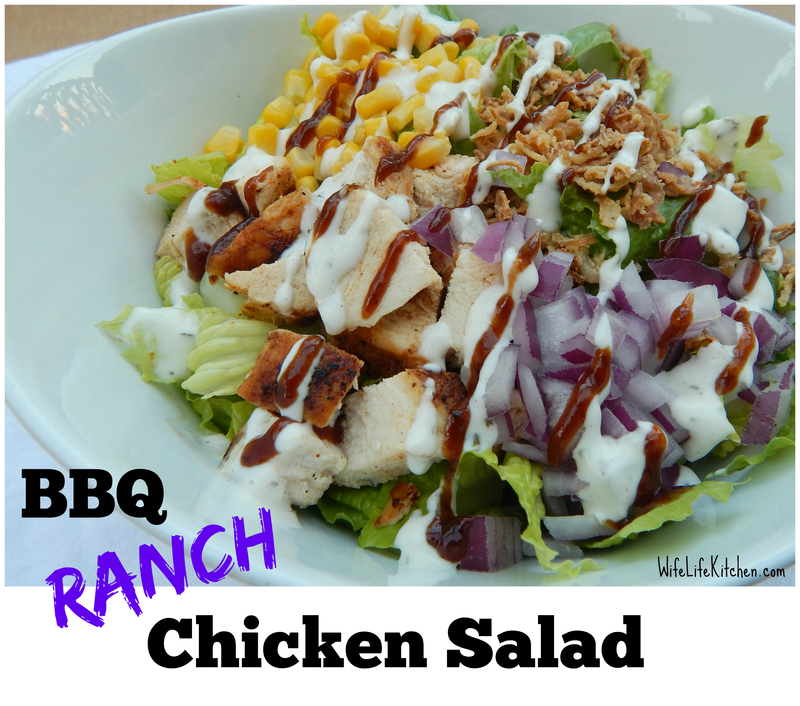 You can dress you salad with your favorite BBQ sauce and your favorite ranch. One of my favorite dressing brands from the store is Litehouse. They are so good! You can find them in the refrigerated section by the produce. So yes, I usually don’t order salads, but this is a really good one I made at home. It’s easy too, because I use store bought dressing this time. If you want to make it even healthier leave out the crispy onions and make your own low fat ranch with some Greek yogurt. You can find tons of recipes for that online. Here is a look at the salad before adding the dressing. Drizzle it on and make it look fancy. 1. 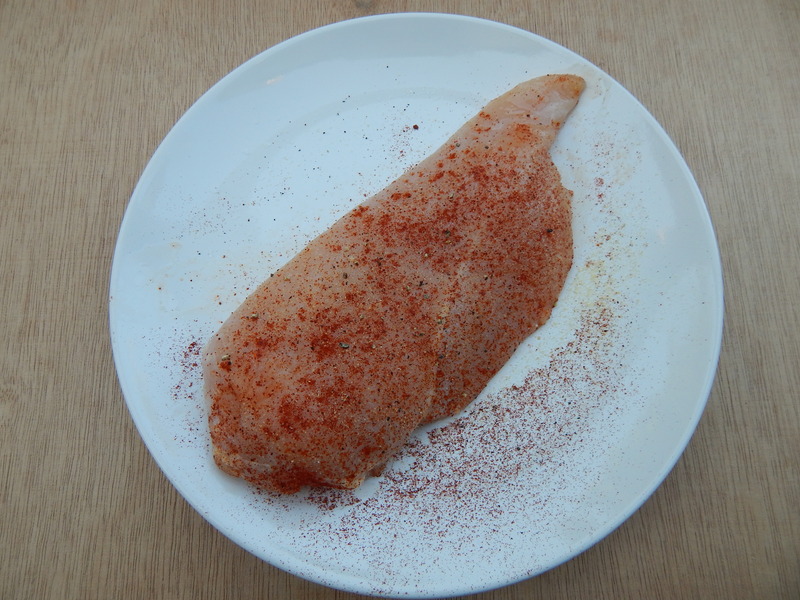 Season chicken breast evenly on both sides with salt, pepper, smoked paprika and granulated garlic to taste. Add olive oil to a small skillet and heat to medium heat. Place chicken breast in the skillet and cook first side for 4-5 minutes. Then flip the chicken breast and cook the other side for 4-5 minutes or until fully cooked. Then remove from the skillet and let it sit on a plate or cutting board for a couple of minutes. 2. While the chicken is cooking prepare the lettuce and salad toppings. When you are ready to serve slice the chicken breast into small cubes. 3. 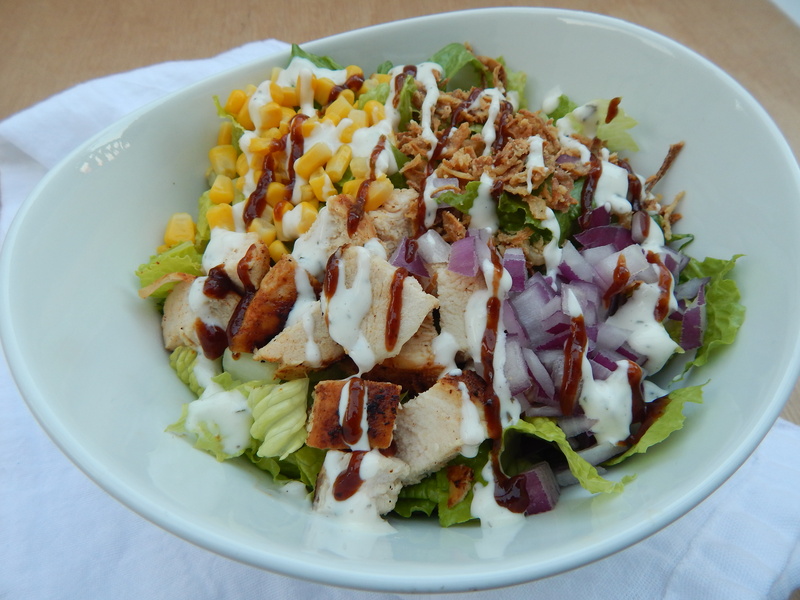 Fill 2 large salad bowls or plates evenly with lettuce. 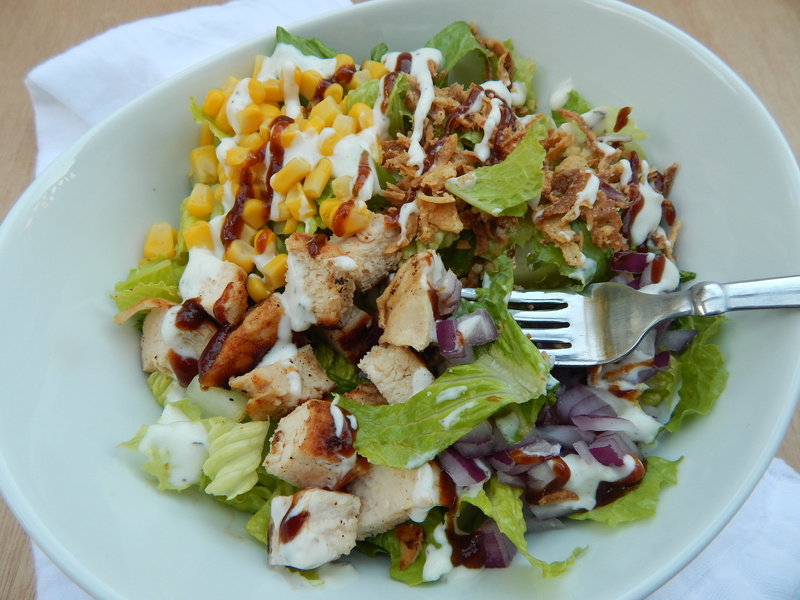 Add your salad toppings by placing each topping over one quarter of the lettuce. (You can sprinkle toppings all over if you prefer, but I think it looks pretty to keep them on separate sides!) Add more of less of each topping as desired. 4. You can spoon the desired amount of ranch dressing and BBQ sauce over the salad or you can get a nice drizzle by using plastic sandwich bags. Add ranch into a sandwich bag and cut the small tip of one corner off then drizzle onto the salad. Repeat with the BBQ sauce in a new bag. Enjoy! • If you don’t have smoked paprika use regular paprika or your favorite chili powder. • I use the crispy fried onion strings from Trader Joe’s, but they are also sold in the salad condiments aisle of most grocery stores near the croutons.